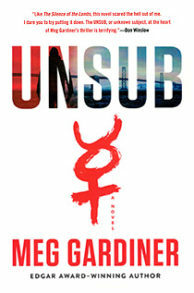 UNSUB by Meg Gardiner is the first in a new series with detective Caitlin Hendrix. She is asked to join the homicide unit because of who she knows. Twenty years ago the Prophet terrorized the city and haunted the detective trying to capture him who also happens to be Caitlin’s father. Wanting to pick Mack Hendrix’s brain those working the case feel his daughter would be the best person for the job. Unfortunately, this “unsub” has returned with a vengeance. As with her father, he is playing with Caitlin’s mind, teasing and taunting her. Mack still has regrets about the one who got away and she is motivated to find the Prophet and bring him to justice, righting a wrong done to her dad. Meg Gardiner: As a young child I remember hearing about the Zodiac Killer who wreaked terror on the Bay area. The Zodiac sent dozens of messages to the police and media, including cryptograms that have never been broken. The terror wrought by the killings still lingers today. I grew up in California, spooked by the knowledge that the Zodiac could strike at any time. Today, I’m spooked by the thought that the killer hasn’t been caught. The Zodiac could still be out there. And, being a thriller writer, spooky thoughts lead me to spooky ideas. What if a terrifying cold case turned hot again? What if a killer who’d disappeared resumed killing decades later? And what was his motivation: killing for thrills, lusting for the publicity, and/or trying to gain power over people by fear. MG: The good guys must be careful not to become those they are pursuing. They need to beware that a line exists, where it exists, and stay on the side that respects the law. Cops have developed PTSD because they find these cold cases very real and devastating. The case gets under the cops skin and never gets out. EC: Can you explain the relationship between Caitlin and her father, Mack? MG: It is strained. He was her hero growing up yet she found it very painful to watch him unable to come to grips with not solving this crime. Because she loved him she wants to right the things he could not. The Prophet forces them to reconnect and face their own demons. I put in the book this quote, ‘Job stays at the station,’ because she saw how this case broke her dad emotionally, consuming his life. MG: He is only too happy to ruin her life as he had her dads. His plan and end game is to treat daughter like father. He is smart, sadistic, Machiavellian, and determined. I delved into codes, puzzles, astrology, poetry, ancient symbolism, and 21st century hacking. The Prophet is a master of mind games. To stop him, Caitlin must do what her father couldn’t. She must decipher both the Prophet’s old, taunting messages and his strange new rhymes. What do the crime scene tableaus signify? What does the Mercury sign mean? And what is the Prophet’s end game? How has literature seeped into our imagination and does poetry and mythology still resonate on a deep primal level? MG: It is a tough job and a partner is needed who understands the rigors and dangers. Women who take on this job are aware they assume the mantle of authority and some guys are not able to accept that. A lot of female police officers do end up with people in the same line of work. EC: A welcome relief from all the tension is the scenes with Caitlin’s dog Shadow? MG: I am a dog lover. The name just came to me after I saw this black dog with white paws and big ears. I grew up with a yellow lab named Duke. Since I do not have a dog at this moment I think I probably made the dog a character in this book, and yes, he will be in the next book. EC: Can you give us a heads up about the next one in the series? MG: It is titled Into The Black Nowhere. Caitlin is now working for the FBI as a behavioral analyst. She is tracking a slick and charming killer across the country. EC: What do you want the readers to get out of this book? MG: A good entertaining story where readers will hold their breath.